Cal-IPC’s mission is to protect California’s environment and economy from invasive plants. Cal-IPC formed in 1992 to address one of California’s top environmental threats. We work closely with agencies, industry and other nonprofit organizations. Our active membership includes public and private land managers, ecological consultants and researchers, planners, volunteer stewards, and concerned citizens. Cal-IPC works on behalf of all Californians, and our success depends on engaging people from many backgrounds and communities. We are committed to values of equity, diversity and inclusion (EDI) in conservation. Cal-IPC maintains the California Invasive Plant Inventory, a comprehensive list of invasive plants based on ecological impacts, as well as “Watch” plants that may become invasive in the future. Each plant is assessed using a transparent criteria system with documentation of sources. 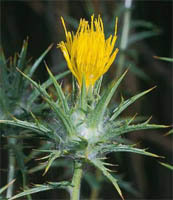 The Plant Profile page for each plant links the top information on the plant’s biology and management. 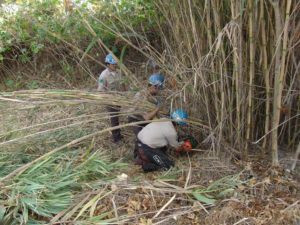 Managing invasive plants is an important aspect of land management and ecological restoration. Cal-IPC holds an annual Symposium featuring four days of presentations, posters, trainings and field trips. The Wildland Volunteer Network provides resources for volunteers. Our website serves as a library of reference materials. Our quarterly Dispatch newsletter keeps the restoration community current on the latest information. Cal-IPC maintains the CalWeedMapper, an online decision-support tool to support regional prioritization and strategic planning. We work closely with Calflora to provide tools for mapping invasive plants and tracking projects. We work with regional partners to plan, fund, and implement invasive plant control projects. Cal-IPC leads advocacy efforts to secure funding for strategic invasive plant control projects, including through collaborations such as Weed Management Areas (WMAs). Cal-IPC serves as a leader with the California Invasive Species Advisory Committee, the National Association of Invasive Plant Councils, the North American Invasive Species Network, and the National Environmental Coalition on Invasive Species. Cal-IPC works with nurseries and gardeners to address this major pathway for introduction of invasive plants. Our Don’t Plant a Pest! brochures suggests safe landscaping alternatives. We work with nursery and landscape trade organizationsas part of the PlantRight partnership to develop voluntary industry measures.